Oregon Aglink honored two leaders in agriculture who accepted awards for their achievement during the 13th Annual Denim & Diamonds Dinner and Auction at the Governor Hotel (now Sentinal Hotel) on Friday, November 19th, 2010. Dalton Straus of Straus Ranch in Central Point was honored with the Agriculturist of the Year award presented to him by Oregon Aglink President Jack Hay. Well-known as a rancher and an active leader in the Oregon agriculture industry, Dalton Straus has been recognized for his commitment to several ag associations including the Oregon Farm Bureau, Northwest Farm Credit Services, the Oregon Cattlemen’s Association, and the State Board of Agriculture. So, who is Dalton Straus? What does he care about and how did get where he is today? For starters, he’s modest. “If you’ve lived a long time, people feel the need to give you an award,” Straus jokes. Straus was born and raised on a dairy farm and ranch, driving a tractor for the first time when he was about eight years old. He recalls driving the cattle to the mountains as his earliest and fondest memories of life as a rancher, enjoying the beauty of the woods. His favorite job on the farm was the hard-labor task of hauling hay, turning it into a sport and competing with his cousin to haul more hay than the previous day. Straus was active in sports in school and naturally enjoyed activities that challenged him. This trait helped him go far in the military. At the start of the Korean War, Straus joined the Army and served for three years, quickly moving up the ranks and finishing as a 1st lieutenant. He loved being in the service and thought about re-enlisting, but feared he would miss life on the ranch too much. Straus returned home to his father and uncle’s ranch and shortly after, joined the Army Reserve, where he served 28 years while juggling work on the ranch. “It was one of the smarter things I’ve done in my whole life,” Straus says, “I got promoted way sooner than I thought I would and ended up retiring as a full colonel.” While balancing work on the ranch with Army Reserve activities was difficult, Straus persevered with the strong support from his family. Eventually, Straus went into partnership with his father on the ranch. As a leader and ambassador for the Oregon ag industry, one might not expect Straus to describe himself as “shy.” “I’m actually a very shy person. I keep my thoughts to myself. I don’t try to get out in public and don’t feel comfortable with public speaking,” Straus says. Straus credits the beginning of his leadership involvement to a man named Gordon Stanley, and his inability to say “no.” Gordon Stanley was a friend of Straus’ who was involved in the Cattlemen’s Association. “He was one of the ones who grabbed me by the ear and said ‘you’re going to be a leader in this organization whether you want to or not,’ ” Straus says. “So he finally convinced me in going for Vice President. He would probably be the guy that I blame a lot of it on,” Straus jokes. What does Straus enjoy most about being a rancher? “Being able to associate with the people in the business, both professionally and socially. The people we work with to keep us going, the folks from OSU, the Department of Agriculture, the vendors we buy our products from, even the bankers. To be able to enjoy the social sphere that we find ourselves in is truly enjoyable,” Straus says. Today, Dalton and Ruth own and operate Straus Ranches in three counties—Jacksonville, Josephine and Douglas, with a total of seven to 10 employees. “I enjoy being on the ranch, being able to look around the house and see everything nice and green and see the mountains around me; seeing the calves jump and play, its just such an enjoyable way of life,” Straus says. Farmers Ending Hunger was honored with the Ag Connection of the Year award which was presented to Fred Ziari, founder of the organization. In the face of tough economic times, most people tighten their belts and make charitable giving a low priority. This is not the case for Oregon farmers. FEH is a non-profit organization that was started in 2005 with the intention to use the resources of farmers to feed hungry people in Oregon. 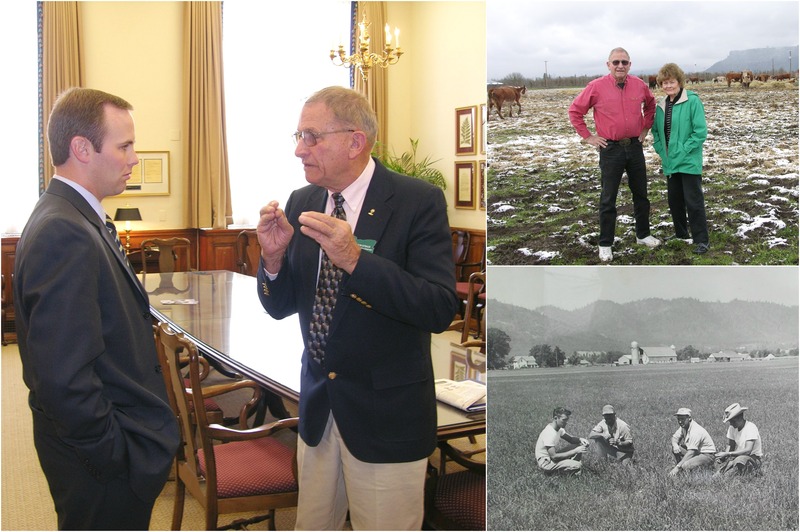 In 2004, founder Fred Ziari, an agricultural engineer, was invited to a meeting at the Oregon Food Bank to address Oregon’s hunger problem. He learned at the meeting that Oregon was ranked number one in food insecurity in the United States. On his way home, Ziari thought to himself, “I’m a pretty smart guy, and I didn’t have a clue that this was going on.” Ziari was so impacted by the thought of Oregon being the hungriest state in the nation, so he decided to do something about it. He thought, “Who better to feed hungry people, than farmers?” Ziari immediately got on the phone with some of his friends involved in the ag industry and pitched the idea of starting a non-profit, and FEH was born. The model was designed so growers could donate a portion of their farm production for distribution throughout emergency food networks in Oregon and southwest Washington. They started out within their network, asking farmers they knew to get involved. 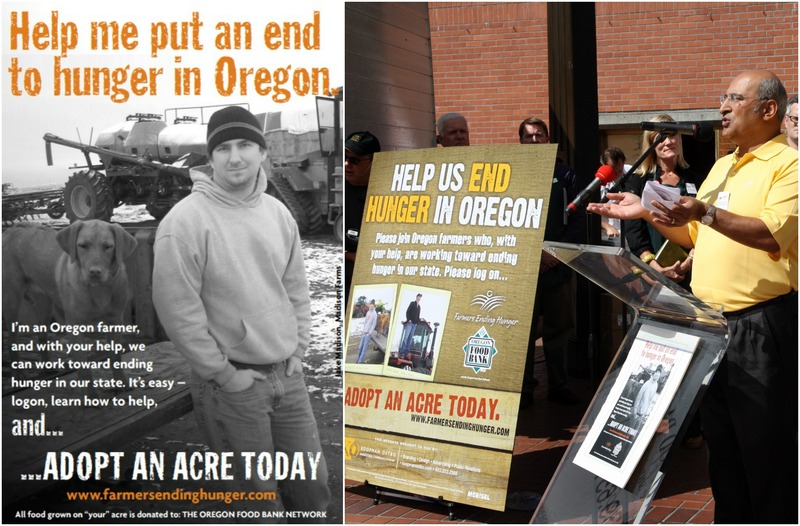 By 2006, FEH convinced five growers to participate, donating 173,000 pounds of peas which went to the Oregon Food Bank. After that first year, FEH continued to expand, acquiring 800,000 pounds of donated food commodities in 2007. The next year they received just over a million pounds of donated food and in 2009, FEH boasted 2.1 million pounds of donated food crops. “The products that are donated are coming right out of harvest. It’s not stuff leftover,” says John Burt, executive director of FEH. “For Farmers Ending Hunger to basically step up and do what they’ve done and then tell their story has really shed that light on agriculture in Oregon–that we are compassionate, that we care about the products that we grow, that we care about the land that we take care of, and we care about the people in our community,” says Katy Coba, director of the Oregon Department of Agriculture. There are a lot of players involved in making FEH successful. The farmers and ranchers donate the food commodities, which has included everything from potatoes to wheat to cattle. The wheat and cattle are not sent straight from the field to the food banks, of course, but processed into pancake mix and ground beef. Vegetables are often frozen and canned to prolong the shelf life of products. Many dedicated processors are involved to make that happen. One hundred and eight individuals and businesses have supported FEH through its “Adopt-An-Acre” program, which allows individuals to adopt an acre of farmland to help cover the expense of processing crops into high quality food. Molly Pearmine of Pearmine farms said it was a natural fit to donate to FEH. She knew that an acre of corn could produce 114,000 cans of corn, which could make a big difference for hungry people. “An acre of green beans or an acre of corn isn’t that much more to maintain and manage the rest of the season to then donate. It’s only appropriate that farmers should be feeding people,” Pearmine says. FEH hopes to deliver 2.2 million pounds of food commodities to the food bank networks this year. In a few years from now, Burt hopes FEH can procure four or five million pounds of donated food. “Just to be able to say that we were part of that effort, that farmers, the agricultural community, stepped up when there was a big need, and we were able to help to contribute to hopefully—someday–end hunger,” says Burt.